Anil Agarwal needs to dig deep. The Indian tycoon’s London-listed energy and mining group, Vedanta Resources, is edging closer to breaching the limits imposed by its banks on their slice of its $8 billion of net debt. The stress will likely force him to pay up to push on with an overdue simplification of the sprawling group. Vedanta Resources is a holding company and relies on cash flows from its various operational subsidiaries to service its obligations. Net debt at the parent is equal to almost three times annualized EBITDA for the first half of the year to September. A covenant of 2.75 times on its bank loans will next be tested in March. Vedanta’s bonds due in 2019 are trading at less than 50 cents on the dollar. Agarwal is cutting costs and is in talks with banks, but creditors lack confidence he will be able to efficiently tap cash buried further down the group. Vedanta Resources owns around 63 percent of Vedanta Ltd which, in turn, owns almost 65 percent and 60 percent of cash cows Hindustan Zinc and Cairn India. Funneling cash up through dividends is highly inefficient and intercompany loans have proven controversial in the past. 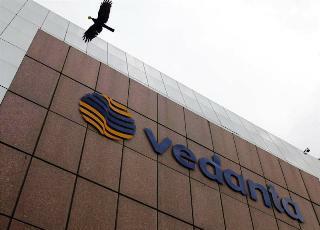 Vedanta Ltd can only increase its stake in the zinc unit if the Indian government sells. Meanwhile its June bid for the rest of Cairn also looks troubled. The commodity rout means the offer of one Vedanta Ltd share, plus preferred stock, for every Cairn share is now worth 34 percent less than Cairn’s market price, versus an initial premium of 7 percent. Agarwal can’t offer more Vedanta Ltd shares without his holding company ending up owning less than half of the enlarged group, which would create problems for the London parent. Restoring the original premium would mean increasing almost six-fold the value of the short-lived preference shares, which are effectively a cash sweetener. At current market prices, that would consume more than one fifth of Cairn’s $2.8 billion cash pile. That is a cost that may be worth bearing. But it still might not be sufficient: some large Cairn investors have already said the original bid was too cheap. If Agarwal can’t come up with an acceptable offer and the commodity slump continues, his options will only get worse. Vedanta Resources said on Jan. 20 it would repurchase up to $227 million of its $1.1 billion convertible bonds due in July 2016. The London-listed Indian mining group had previously said it would repurchase up to $500 million. The price will be set by a Dutch auction and funded from a term loan and from the part-repayment of intercompany loans from subsidiaries. Vedanta Resources had $8 billion of net debt at the end of September, or 3.1 times the company’s annualized EBITDA for the first half of the fiscal year. The company has a covenant of 2.75 times on its bank loans. The holding company is controlled by Indian tycoon Anil Agarwal. Vedanta Resources owns 62.9 percent of Vedanta Ltd which, in turn, owns 59.9 percent of Cairn India. In June, Vedanta Ltd offered to buy out the rest of Cairn. Shareholders would receive one Vedanta Ltd share for each Cairn India share plus a 10-rupee preference share paying an annual 7.5 percent coupon that could be redeemed at par after between 30 days and 18 months. The offer initially implied a premium of 7.3 percent for Cairn shares. The sharper decline in the share price of Vedanta means the offer now implies a discount of 33.6 percent.